Part of the fantastic Go MINI range from GB Toys includes this fantastic Stunt Launcher. Designed to be used with any of the fantastic Go MINI cars, kids love revving up the launcher with the realistic looking gear stick. When they’ve built up enough speed, they slam their hand down on the big green start button, and the MINI shoots off at high speed! Go MINI Stunt Launcher can be used with any of the cars from the Freestylers or Stunt Racers collections. With names like Tiger, Bulldog, Bite, Rebel and Beats, kids will want to collect all of them! Put two or more Stunt Launchers side by side, and watch as each car performs a different stunt – Salt is good at handbrake turns, whilst Blast loves showing off his doughnuts! What better car could there be than the iconic MINI to kick off this exciting collection of GB Toys vehicles. 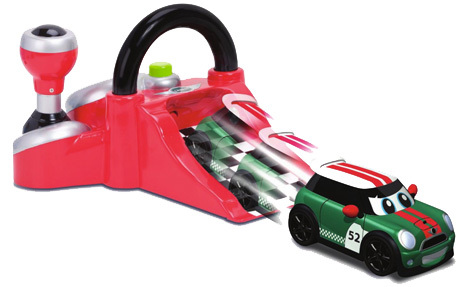 Go MINI Stunt Racer is the perfect way in which to show off the amazing stunts, tricks and sounds in the Go MINI range. Please tell us what you think of the Go Mini Stunt Launcher by Go MINI.